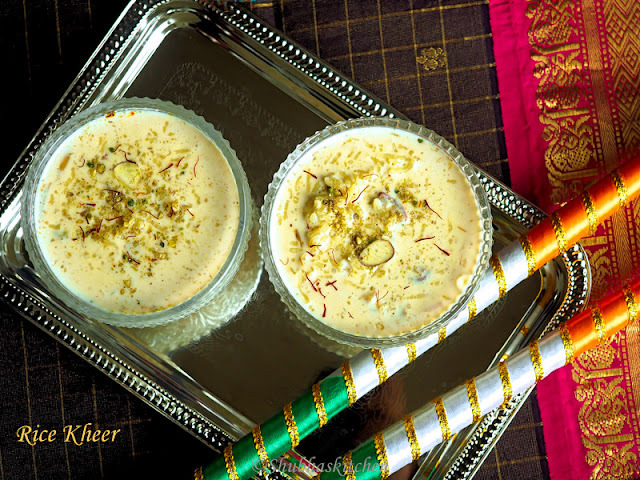 Rice Kheer is a delicious and popular pudding prepared during festivals or to celebrate happy occasions. It is very easy to prepare and makes a great dessert for parties as you can prepare it well in advance and refrigerate it. Sometime back, I had posted a recipe of Rice kheer sometime back. The kheer that I am posting today is slightly different. In the previous recipe , I had cooked the rice in milk while in today's recipe, I will be using cooked rice which be added to boiling milk and then sweetened with condensed milk. This method is much faster than the previous kheer recipe. You can very well use left over rice for this kheer. This recipe comes in very handy when you have too much rice thats left over after a dinner take out. There is alot of rice that accompanies the curry when you get a take out. 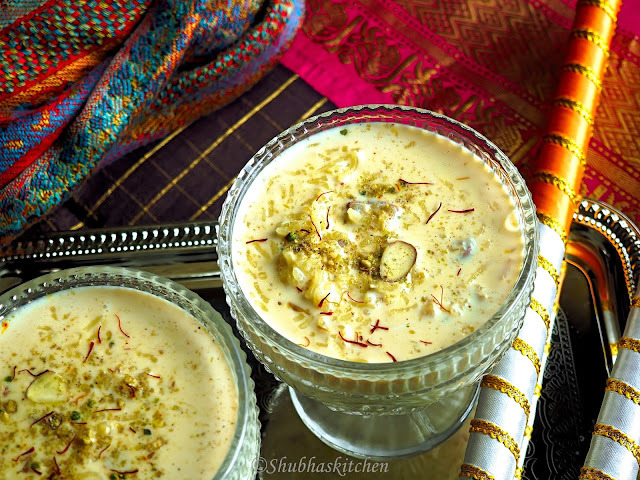 I have used whole fat milk but you can very well make the kheer using reduced fat milk too. 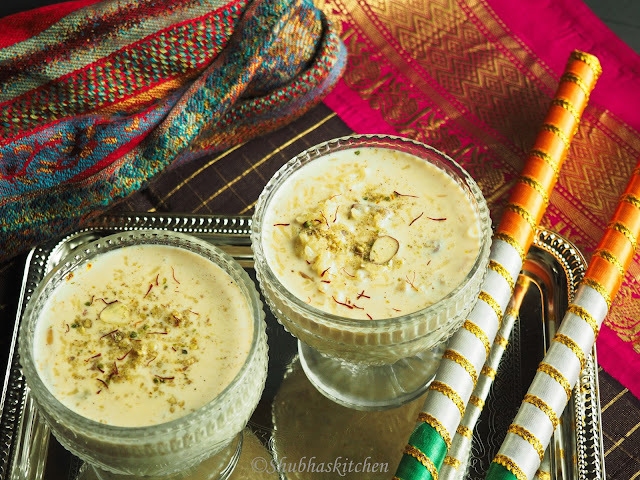 I have used dates and nuts to add richness to the pudding.. Saffron , nutmeg and cardamom add a nice aroma to this creamy dessert:) I have added a pinch of salt which enhances the flavors even more. Boil milk in a thick bottomed pan. Add saffron. When the milk comes to a boil, add the dates and the nuts. Add the cooked rice and a pinch of salt. Reduce the heat to low-medium. Keep stirring regularly so that the milk does not stick to the bottom. Cook until the kheer/pudding thickens.Once thickened, add the nutmeg and the cardamom powder. Turn off the heat.Serve hot or chilled. What a joy. Believe me you, I love such a rice payasam. I can get the taste and scent, right now. Absolutely delicious! I just adore kheer, it is one of my favourite childhood desserts, and yours is so beautiful to look at! I also love all the flavours in these bowls!